Livestock feed sales representatives use their knowledge of animal nutrition and sales skills to market feed products to dealers and livestock production facilities. Livestock feed sales representatives are responsible for marketing a manufacturer’s feed products to dealers such as local feed, farm, and hardware retailers. Feed sales reps may also sell directly to horse farms and livestock production facilities. Livestock feed sales reps must constantly educate themselves about the livestock feed industry and their company’s specific product line. They must also aggressively seek out new prospects and work to develop additional sales accounts in their designated territory. Most livestock feed sales representative positions are field-based, requiring frequent travel throughout designated territory to market products. Sales reps also must visit retail locations to provide training and marketing materials to the dealer’s sales staff. Participation in industry trade show events or conventions may also be required. Sales reps must maintain detailed records of their sales, develop prospect lists, file expense reports, schedule visits to dealers, prepare sales presentations, and provide ongoing customer service and support to their clients. Sales reps generally have a flexible schedule, but their work hours often include nights and weekends. Many livestock feed sales representatives specialize in offering a line of feed products for one major species such as horses, cattle, sheep, or poultry. Representatives may also specialize further by offering products which target a specific segment of the species. Equine feed sales representatives, for example, may concentrate on offering feed products designed specifically for either performance horses or breeding stock. Livestock feed sales representatives can also use their skills and experience to transition into other related career paths such as veterinary pharmaceutical sales, known to be an extremely lucrative field. Veterinary pharmaceutical sales reps market animal drugs and supplements directly to veterinarians. It is also possible to transition to pet product sales, part of the $50 billion dollar a year pet industry. Pet product sales reps can offer a wide range of products to pet boutiques and other retail outlets. Livestock feed sales representatives can come from a variety of educational backgrounds. While there is no specific educational requirement for those entering this career, most manufacturers prefer that their sales rep candidates have a degree in marketing, business, animal science, agriculture, communications, or a veterinary related field. A masters degree further enhances your chances of advancing to a supervisory role, such as a position in sales management. 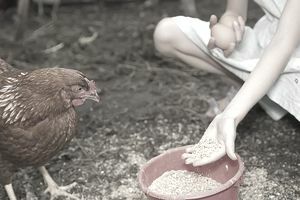 Prior experience working in retail feed sales environments, such as a feed or farm supply stores, is beneficial. A sales rep should be extremely familiar with the animal species for which they are marketing products, as they will be dealing with professionals in the field. New sales rep recruits generally go through a company-sponsored training program before entering the field. Sales training can last anywhere from a few weeks or several months. The sales management team also provides continuing education for sales reps as new product lines are developed and introduced to the market. There are several membership groups for those in the sales industry. One well-known group of sales representatives is the Manufacturers’ Agents National Association (MANA), which offers market research studies, continuing education opportunities, and local networking events for manufacturers’ agents. A highly regarded certification program is provided by the Manufacturers Representatives Education Research Foundation (MRERF). The MRERF offers certification as either a Certified Professional Manufacturer’s Representative (CPMR) or as a Certified Sales Professional (CSP). Compensation for livestock feed sales representatives can be based on commission, salary, or (most frequently) a combination of the two. Sales reps also usually benefit from some type of bonus structure that rewards outstanding performance upon the achievement of certain sales milestones. According to the U.S. Bureau of Labor and Statistics, the middle 50% of sales representatives earned between $48,540 and $99,570 per year during a 2008 salary study. The lowest 10% earned less than $34,980 per year and the highest 10% earned more than $133,040 per year. The median wage for sales representatives was $70,200. Those individuals working in field sales positions often receive additional compensation and benefits such as an expense account for entertaining clients, paid airfare and hotel stays, and use of a company vehicle. Sales representative job opportunities are expected to grow as fast as the average (about 7%) for all careers, so competition should remain keen for available positions. According to the BLS, job prospects will be best for those holding a college degree, expertise in the field, and solid marketing skills. Do You Want to Become a Veterinary Pharmaceutical Sales Rep?